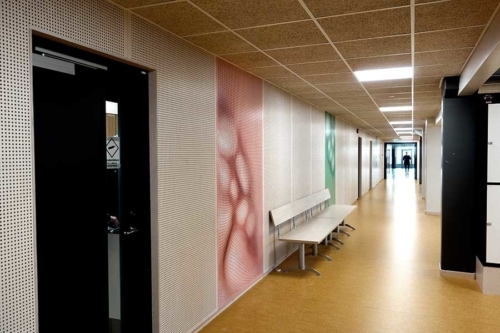 The starting point of my idea is the school’s acoustic panels that spread over a larger part of the walls. 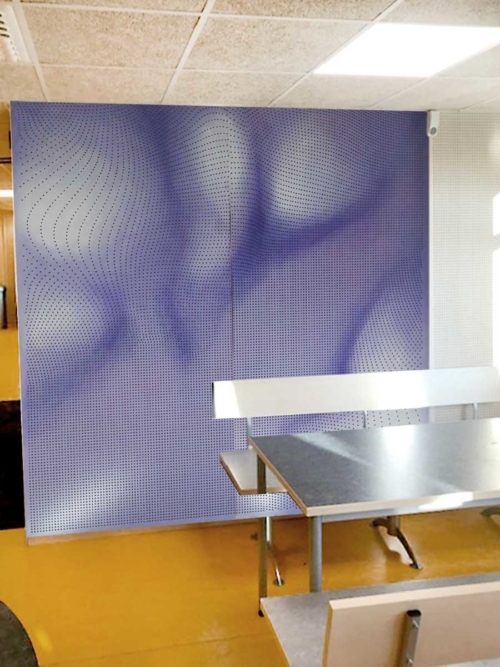 On selected panels, the holes are re-positioned to produce optical illusions of curved room / wall motion. The original regular hole structure can be seen as the molecules of a solid state material while the displaced holes can be seen as displaced molecules in a liquid or an elastic material. 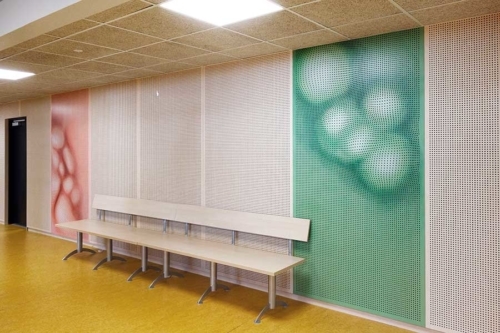 Creating an illusion of movement in the otherwise static walls also promote the creative imagination and encourage seeing potential in something static and repetitive, as a regular dot pattern. In this context, I also thought of the Lindome chairs that the area is known for. The chairs serve their purpose and perform the functions of offering a seat and at the same time consists of ornaments that are not really necessary for the function but, nevertheless, are desired for aesthetic reasons. 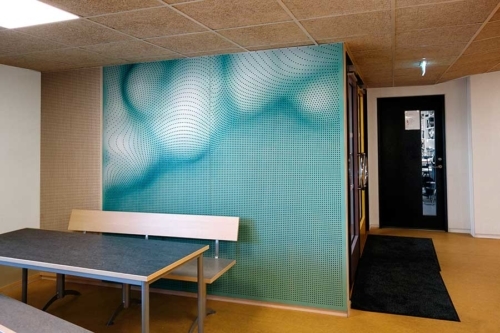 The chair therefore becomes more than just its main function. 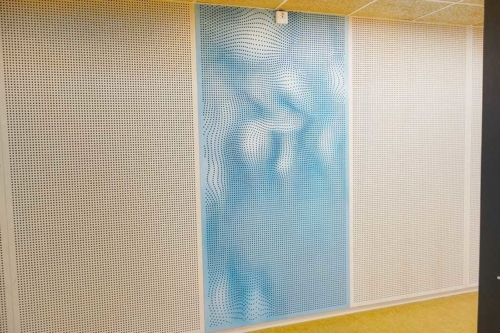 This can be seen in relation to the artistic composition of the acoustic panels, where the sound-absorbing function (perforated holes) is the starting point for the design. 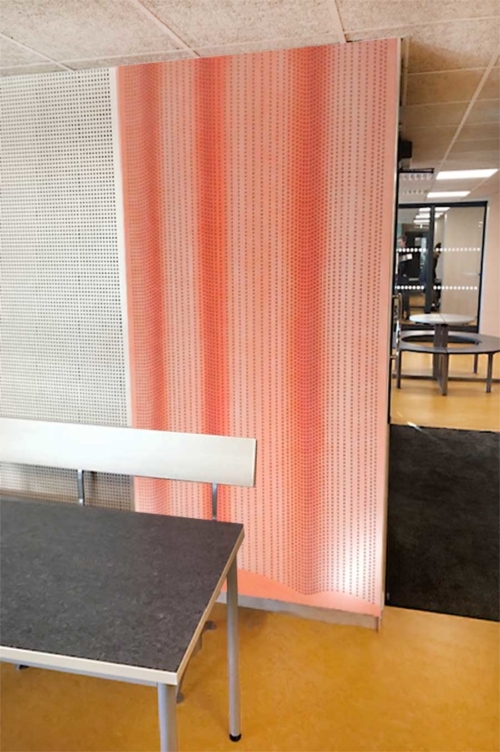 The existing dot matrix structure is picked up and transformed. 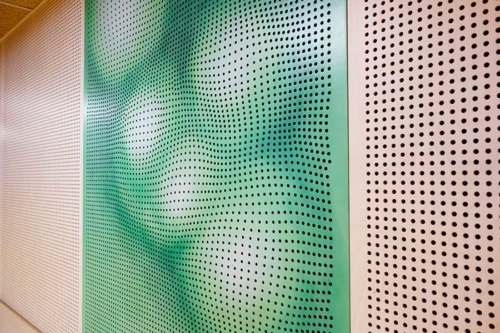 The newly created dot matrix comments on the structure of the existing architecture and becomes a protagonist in the new forms. 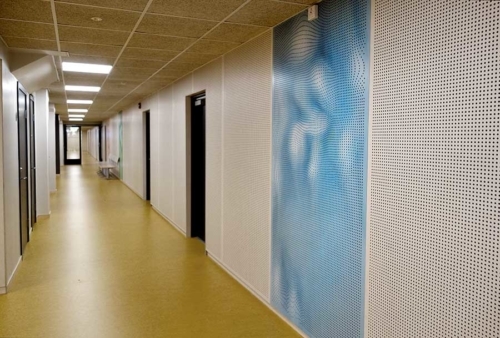 They retain the dual function of embellishment and functional component as sound absorbent. 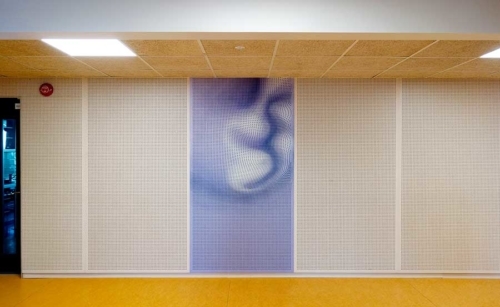 The motifs are created from a processual ephemeral process of movement and curvature of space by generating different optical transformations / deformations from a planar surface. By reducing the structure to the dots, the design of the virtual computer world and computer 3d reminds. It can also be associated with the computer game aesthetic. With the abstract but different motives I try to break the room’s symmetry and create orientation points by using different colours that are chosen in relation to the yellow floor. The use of the paint in the works enhance the three-dimensional feel and make the works stand out.